I see two problems; many web professionals and agencies don’t have time and resources to do this keyword research. And those that own a website generally need to know what to write about that can get their website found and traffic. Keyword research is the backbone of planning websites and creating content that can rank and attract links. 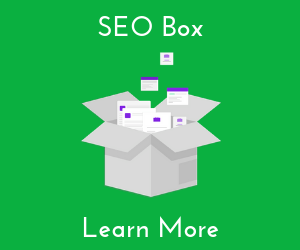 I have created an advanced keyword research course for members of SEO Box; my SEO membership. There are 16 advanced research strategies that can help you learn keyword research fast and uncover search and click volume opportunities for a new or existing website. I produce a concise report that shows the client's best performing pages and compares their website traffic with key competitors. This report makes your job of selling and adding value so much easier. As a marketing or advertising agency you'll do your fair share of pitching to acquire new clients or retain existing ones. I produce a competitor analysis of website traffic, the client's top pages and keywords along with a recommended improvement strategy. Happy to recommend you to anyone looking for advanced on-page SEO help. WFT Do I Write Each Month? I provide clients with a guide on what to write and create on their website each month. The client is presented with the keyword research, the opportunity, the title of the page and an outline of the content and layout. A client in New Zealand's 2nd and 3rd top pages in terms of ranking and traffic are a result of these reports. I undertake research and map out what you need to create for your website and promote for the next 3 months. I get 70% of my website traffic and leads from articles and blog posts (not service pages). Big shoutout to Fraser McCulloch on his excellent keyword research / content ideas service. My sites traffic has increased 89% in one month from 827 visits to 1585 visits. Want to know what to create and promote for the next 12 months ? I do some intensive research and map out 12 opportunities for you to grow your organic traffic and links. 90% of website don't get traffic from Google because they don't have pages targeting what people search for. So I do keyword research to identify what pages your new website needs and what you need to write on those pages. Then I will give you wireframes of how the website should be laid out. You are getting the blueprints or architect's drawing so that web designers and web developers know what to build. We have a marketing agency in NZ and have used Fraser for keyword research for our clients. He's excellent and would highly recommend him. A client wanted to double their business from £2m to £4m in 12 months. So I had to analyse their past performance, traffic levels and spent in order to map out a plan to help them reach their goal. Are you spending your budget in the best channels to reach buying customers ? How does your Facebook spend compare with your Google Shopping spend in terms of cost and return ? I analyse every angle of your website. I recommend on page improvements, content to create and links you need to earn to grow organic traffic. I will identify your in house resources; do you have the resources for advertising, content creation, link building, photography and marketing ? Then I'll give you an in-depth report along with a recorded version and either meet in person or on video to discuss. There's not a problem I can't fix cos I can do it in the mix ! Why am I not ranking on page one anymore for this keyword but I can for that keyword ? Or, I wrote that page about this topic and it's not ranking at all. Or the website suddenly went from 300 indexed pages to 7000 indexed pages and traffic has dropped. Like a doctor, I won't know how to solve the problem until I've diagnosed it. So any SEO problems you know about, bring em on ! Most SEOs know that relevant links are the dominant ranking factors. So if we can build more relevant links we can boost organic traffic from Google. Analysing your competitors or industry website backlinks can reveal their link building strategy. A recruitment client's competitor earns their best links from University website resource pages. So his content strategy is to create resources for students seeking employment guides. My own link building strategy was built around finding broken links that other web agencies linked to. For a sports client, I found their competitors mainly earned their links by providing image resources for journalists and bloggers to utilise or link to. Every industry and website earns their links differently but competitor backlink analysis can speed up your link building strategy. So the top 10 pages in Google receive, on average, 1050 visits a month from Google. Your page is down at position 17 and gets 96 visits per month. After this analysis I discovered that if you improve the quality and content of your page and promote it, you'll only need 3 more links to your page to rank it on page one. That improvement and investment is with an additional 1000 visits a month or 12,000 a year. The commercial value of that extra traffic is worth $30,000 a year. That's what you would pay Google to earn that traffic from paid advertising. The extra 1000 visits a month at your current page conversion rate is worth an additional 40 leads a month or 480 a year. As a web designer or developer you may get excited about this new project to flex your skills. But from the client perspective they are thinking about more than design and code. They want a better return on investment. Doing a website audit before you open Photoshop or Sublime can reveal problems and opportunities both with the website and in the search engines. Please include attribution to Platonik.co.uk with this graphic.